Welcome to day 1 of the Waltzingmouse Stamps May release previews. Today the DT are previewing the fabulous new Country Labels 4. These labels co-ordinate with Spellbinders Labels 4, one of my favorite sets! I just love the country feel to this set, so I went with a primitive, rustic style for my cards. I'm still loving the chalkboard style so I made that the focal point of my card. This new set has five motif stamps, I used the little house on my label. The background plaid I stamped using Pic-Nic Patterns and Off Beat Backgrounds, the little stars are a sneak peek from tomorrow's set. 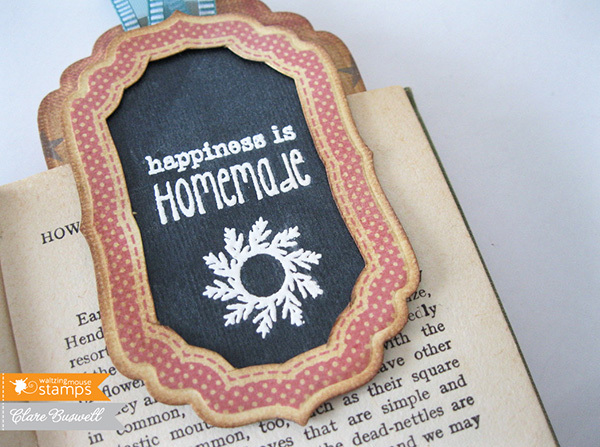 I also made a fun bookmark in the same style, again using Spellbinders Labels 4 and one of the labels from Country Labels 4. There are six great labels in this set and seven sentiments. The bookmark could also be used as a tag. All the cardstock used is from Core'dinations and the edges are inked using Distress Inks - Antique Linen and Scattered Straw. For my second card I used one of the patchwork labels, these are so cute! 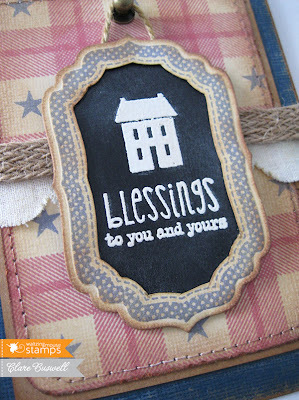 I really wanted a mix of colors so I used Distress Markers to color each section, this is an easy way to color sections of a stamp, I used Barn Door and Vintage Photo. I kept this one fairly simple, again sticking with the rustic country charm! I had to add a bit of gingham and some eyelet lace! The woodgrain cardstock is pre-embossed from Core'dinations. I hope you're loving Country Labels 4 as much as I am, just wait 'til you see tomorrow's set! It's very patriotic! Visit Claire's blog for more details. Here are the DT members sharing creations today! These are gorgeous projects Claire, so homespum and comfy! I love the bookmark, and the little twiggy heart. They look like great stamps, love the idea of the white stamping on the black for this design! 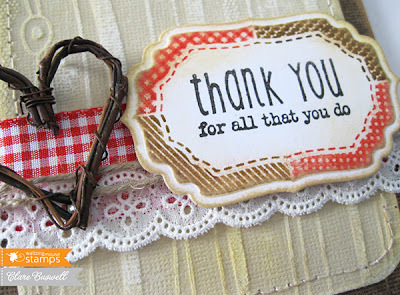 Love the plaid background with these stamps and the style of the bookmark is fab! 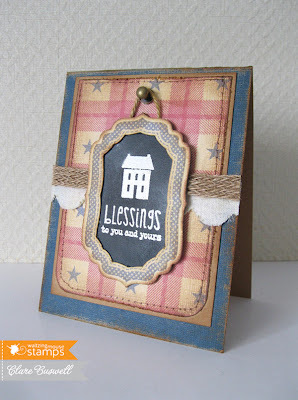 Mmmm, love the vintage homespun feel to these! And that bookmark is absolutely fabulous!! Clare these are amazing!!! 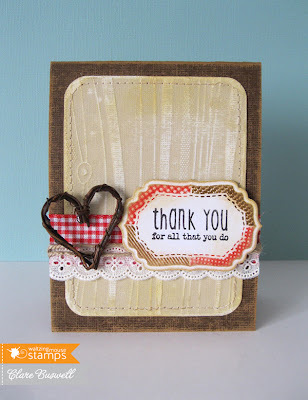 I love the wee chalkboard panels and the Americana plaid background - Awesome thank you label with the multi coloured frame also!! stunning!! Hugs to you!! I am loving that "country" hasn't completely disappeared! Can't wait to see this set revealed. 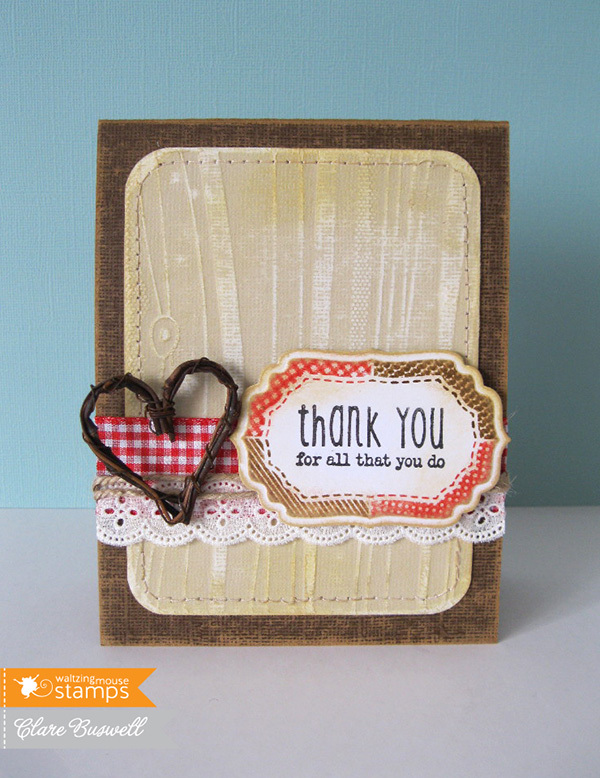 Your last card with the gingham and lace is wonderful, Clare! Clare your cards and bookmark are wonderful! I love the primitive style and this set is one I love already! Oh Clare - how precious these both are. I love the idea of a bookmark, and where did you get that adorable grapevine heart??? What beautiful cards and love the bookmark. Beautiful work! Love the bookmark! Clare, I'm always amazed at how you put things together!! Look at you with your sweet little chalk board - I love, love, love it!! I think both cards are just fabulous. I love the folk art/rustic charm of them both. I love the twig heart on the second card! LOVE this set with the chalkboard look Clare!! So clever and charming!! Your plaid background is perfect and I LOVE the bookmark idea! Keep losing my messages Claire so apologies if there's duplicates! All I want to say is what gorgeous cards and that bookmark is brilliant. I'd love to be using that now!! Both cards are lovely. I especially like the plaid card with matching bookmark. It's very cool how you have the sentiment panel look like it's hanging on the card. Very clever. Great cards... love the bookmark! 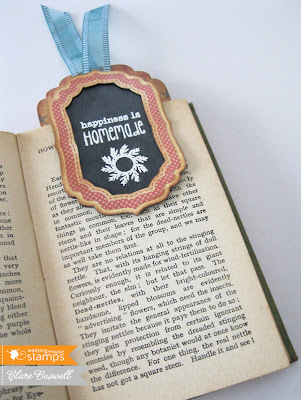 Oh my gosh what a great idea to make a bookmark! Love the cards and the BM , beautiful! I love the card! Background paper is perfect! The bookmark is very creative! Love the plaid with the stars background! !